Hydrogen is becoming increasingly important as a highly promising energy carrier. But it can also be dangerous, as it is combustible and difficult to detect. In order to use hydrogen safely, we need sensors that can detect even the smallest of leaks. Researchers from TU Delft, KU Leuven and the Rutherford Appleton Laboratory (UK) have discovered that the metal hafnium is perfect for the job. Hydrogen stands a good chance of being one of the replacements for fossil fuels as an energy carrier in the near future. It is clean, as water vapour and heat are the only by-products of combustion, and you can make as much of it as you want using just water and another energy source (for example solar energy). But there are still a few hurdles to be cleared before we can start organising our infrastructure around hydrogen. One of these hurdles is finding a reliable way of detecting hydrogen gas. Hydrogen reacts with oxygen, which can potentially cause an explosion. Aside from this worst case scenario, we want to ensure that as little hydrogen as possible leaks into the atmosphere. Although it is difficult to detect hydrogen, it is not impossible. Optical sensors exist. These are materials that absorb hydrogen atoms, a process that alters their reflectivity. This change in reflectivity can be measured, thus providing information about the amount of hydrogen in a particular location. ‘Until now, pure palladium was mainly used as an optical hydrogen sensor’, says Prof. Bernard Dam from TU Delft. ‘But over the last few years, we at Delft have shown that a gold-palladium alloy is a much better sensor. Fellow-researchers around the world are also studying this.’ Palladium-gold, which is also used to make jewellery, has the advantage that it works at room temperature. Unfortunately, it is unable to detect low hydrogen pressures. Research led by PhD candidate Christiaan Boelsma from TU Delft, which has now been published in Nature Communications, shows that Hafnium does have this sensitivity. Bernard Dam: ‘The unique property of this material is that it can optically measure a minimum of six orders of magnitude in pressure. The lowest pressure measured is 10-7 atmosphere, but this pressure is determined by the measurement set-up. It looks as if a pressure of three orders of magnitude lower could be measured with hafnium, but we need to do more research to confirm this.’ Another benefit is that the optical properties of hafnium change linearly with the pressure and temperature of the material. ‘This makes hafnium sensors very easy to calibrate’, says Dam. So is hafnium a better hydrogen sensor than palladium-gold in every respect? No, since the material works best at a temperature of around 120 degrees Celsius. Dam thinks that this problem can be solved by placing a thin layer of hafnium on top of an optical fibre, before heating the fibre with a warm-up LED (see picture). Delft is currently conducting extensive research into hydrogen. Late last year, Prof. Fokko Mulder unveiled the ‘Battolyser’, a device that combines electricity storage and hydrogen production in one system. The Battolyser is a cheap way of creating and storing hydrogen, and brings the so-called ‘hydrogen economy’ a step closer. This research into sensitive hydrogen sensors represents another step in the same direction. 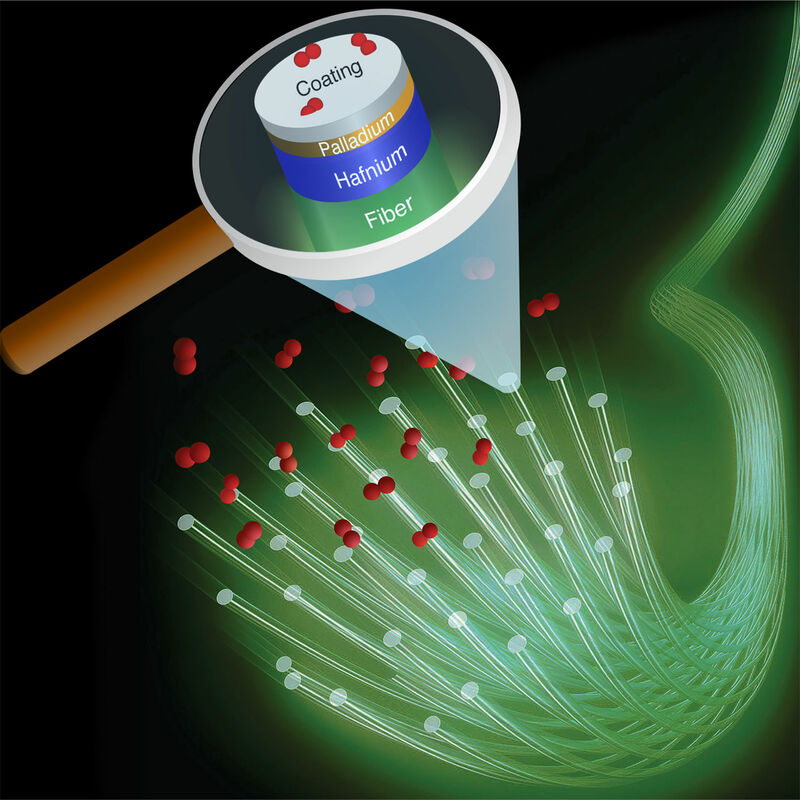 ‘Hafnium - An Optical Hydrogen Sensor Spanning Six Orders in Pressure’ was published in Nature Communications on 5 June 2017. This research was funded by FOM/NWO.